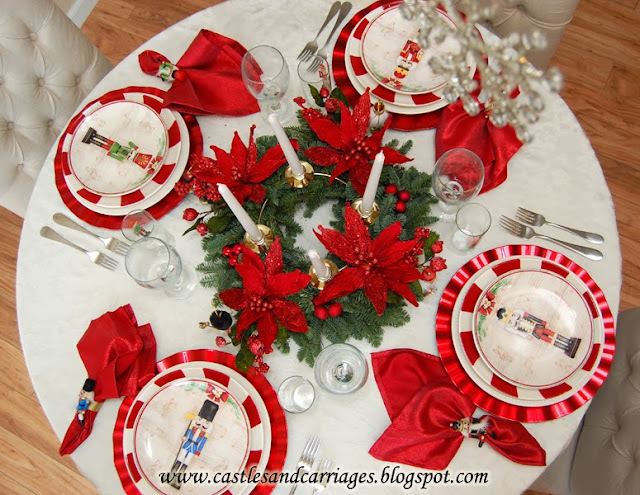 Williams-Sonoma came out with a wonderful set of nutcracker plates but retired them. To my surprise, I found these adorable nutcracker salad plates at World Market this year and so I got a set of plates and napkin rings. The wonderful thing about World Market is that they've brought this collection back year after year. It includes small juice glasses, mugs and serving platters. I wish they would come out with coordinating dinner plates. 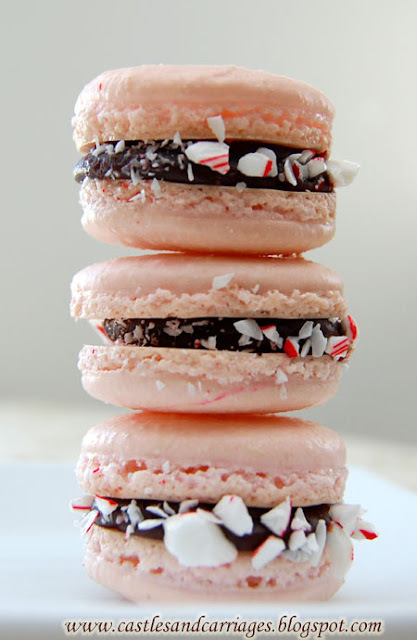 A peppermint swirled plate is underneath the nutcracker plate. My centerpiece is an advent wreath with pearlized white candles and rich red poinsettias that sparkle. Starting from the beginning of December, a single candle is lit each week as a reminder for all of Christ's return. Here is the advent wreath with the candles lit. 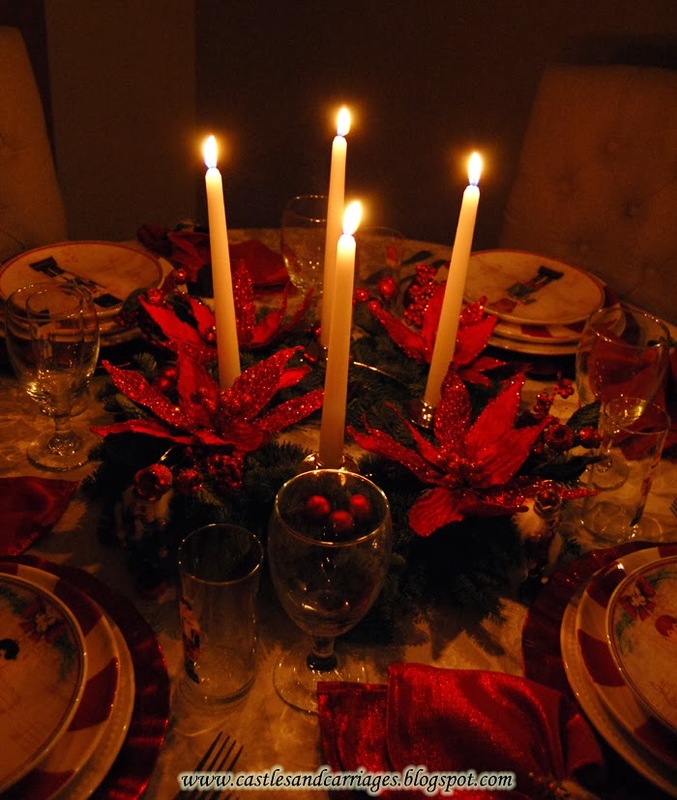 I love how the candlelight brings out the shimmer of the poinsettias and red napkins. 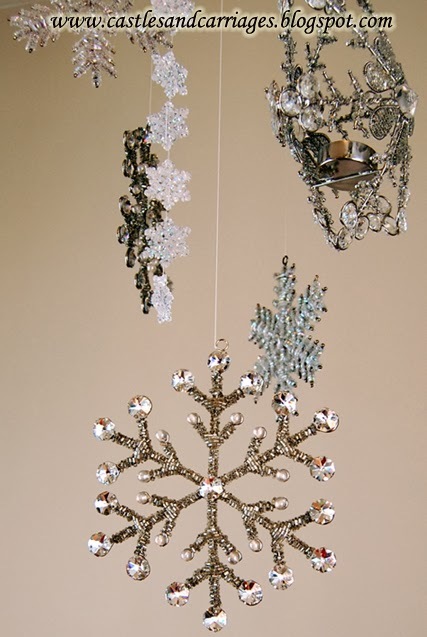 I have a few snowflakes hanging from my dining room light fixture. It was hard to capture them in a photo because of how light my dining room walls are. So here is a closeup pic. 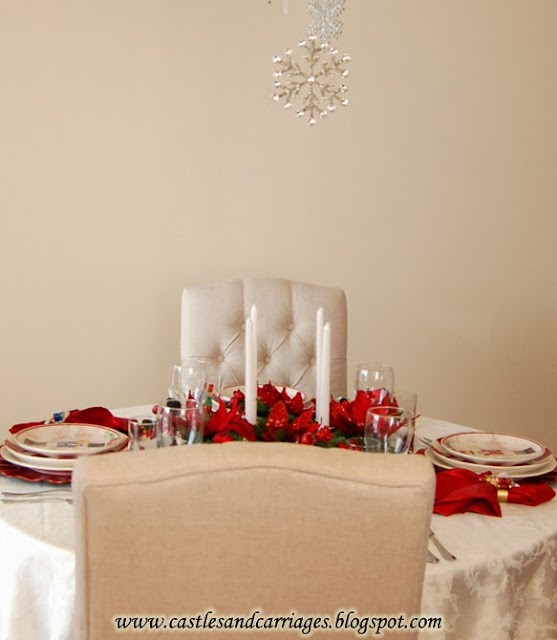 Most of the snowflakes are from Pottery Barn a few years ago and the tealight holder is from HomeGoods. What a gorgeous table! 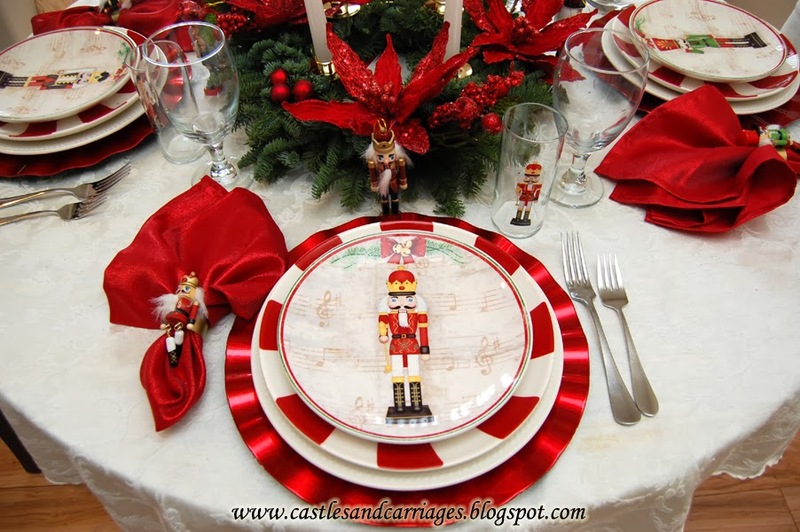 The Nutcracker is my favorite Christmas theme and affordable plates are so hard to find. Thanks for the tip. You made a beautifully coordinated table with them. The coordinating poinsettias work so well. I love this table! I collect nutcrackers and enjoy displaying them at Christmas time too. I'm going over to World Market's site to see if I can find them right now!!! I love the peppermint plates too, the poinsettias, and the advent wreath. 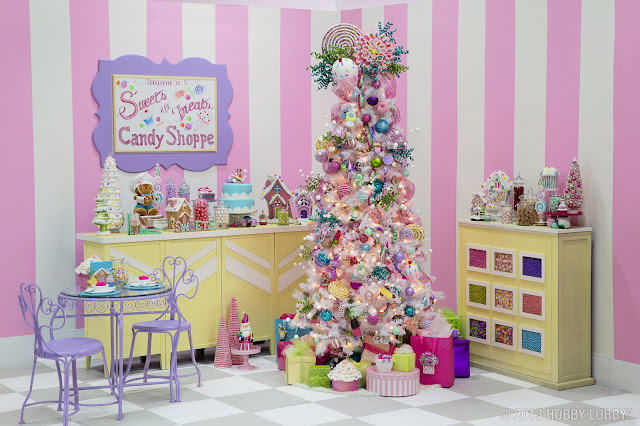 Very festive, great job! Thank you so much Sharlotte! They are definitely still available online. I adore these plates and am glad you do too! I must check in at World Market and see if it has these dishes. They are adorable and I love now you have used them in a way that is both playful and sophisticated. Thank you for your kind comment Lulu! I am considering getting a second set just so I have enough for guests. They are lovely (especially for the price). You always inspire me and that is why I keep coming to your blog ! 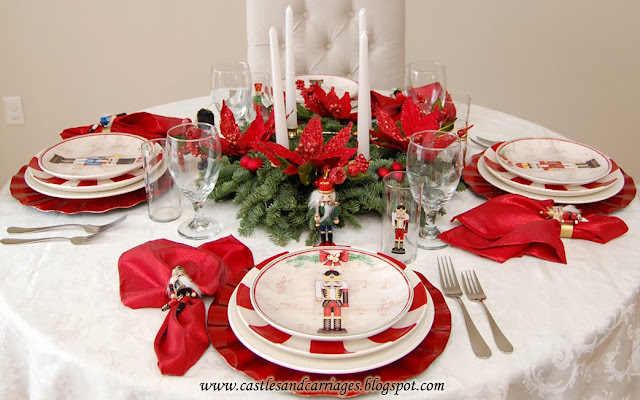 Your tablescape with the Nutcracker dishes are so sweet looks like you had a good time putting this one together for the holidays. Hoping you and your family have a wonderful weekend and please keep warm. What a sweet thing to say Diane! I definitely enjoyed this tablescape. Hope you are enjoying the holidays. Love, Love, Love this tablescape. I love the world market plates, I bought some last month just as they came out and I will also be using them for a Christmas table scape. I have been trying to figure out how your site works. I would like to sign up as a follower. I guess you will be the first to know if I do figure it out. 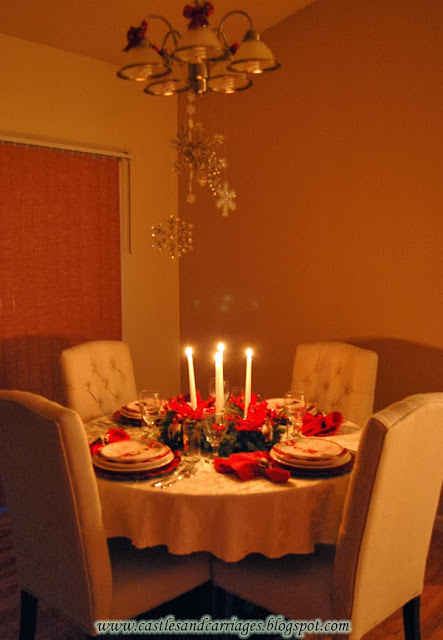 I found you through Google images looking for nutcracker table scape to use as an inspirational piece. I really like what I have seen so far. Thank you for inspiring me. Thank you Candy! I should probably write up something at the end of each post so that people can find out how to comment or become a follower. I love World Market too! I found where your follower stuff is on the hidden side bar. I am looking forward to seeing more of your posts.